Here are a few helpful hints and tips to boost the benefits and get more of what you want! Click on a topic below to read more. Just enter promo code GOODLUCK into the shopping cart to get 30% off your cart, valid on bets on lotteries and scratchcards (max discount £20). Have you got the power? We have! Take a chance on the lottery that created three of the top five biggest jackpot winners of all time. This huge draw from the States created the BIGGEST jackpot winner of all time. Plus, with updated rules, who knows when we'll see a £1 BILLION prize?! 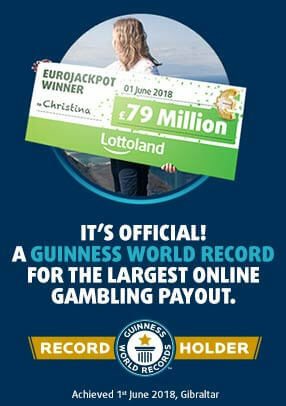 Win the world's biggest scratch jackpot right here at Lottoland. Forget being a millionaire, you could become a deci-millionaire in the next minute! Join a syndicate to get a shedload of line bets, for a fraction of the price, for a sensible share of the jackpot. Boost your chances now! Want to improve your chances on Starburst? Just increase the number of win lines! To avoid breaking the bank, just lower your stake. With a 1 in 29 chance of winning the main jackpot, don't forget about the £360k Plus 1 draw and £180k Plus 2 draw. With bets starting at just £1, you can bet on the New York Keno every FOUR minutes for the chance to win a jumbo jackpot up to £10 MILLION! Win a jackpot on the hour every hour, and get your stake back if you don't match a single number! This one's a game changer! Eyes down! Bingo Jackpot is quick to play, full of fun and each game gives you the chance to win a crazy £20 MILLION jackpot. Pick 5 numbers from 1 to 60 and a Cash Ball from 1 to 4 for the chance to win £1,000 every day for the rest of your life! Have a floral flutter for the chance to win £2,500 every month for 10 years. At £1.50 a pop, with a bunch of free play prizes, it’s bloomin’ marvellous! Match the magic three symbols on this super scratch to get paid £1,500 every single day for the next year! Make every day Pay Day! The winner takes it all with the Swedish lotto. With two draws and a bonus game, this is a feature-packed lotto with maximum value! With this scratchcard you could win up to £1,000 for only 10p. If it's true that horseshoes bring luck, it's a neigh-brainer to try this one. Three weekly draws. No cap on rollovers. No wonder the Italian SuperEnalotto jackpots get so big! At just £2 a bet, get top value today. 30% discount available on all bets on lotteries and scratchcards. Maximum discount is £20, valid once per player. Any participant found to be operating multiple accounts in promotions will be in breach of these and our general account terms and conditions. The promoter will determine at its sole discretion by whatever means it deems necessary to establish if different entries or accounts are connected to the same person.